This well-raced home-built rail mite features an aluminum plate chassis, a 1.5 cc Frog 150 diesel engine driving the left-rear wheel through a centrifugal clutch, and a hand carved wood body styled after that of the 1938 Alfa Romeo 158 (or "Alfetta") gran prix racer. As was typical of many of these British rail mites, the rail guides (or "zonkers") were placed in the center of the chassis. The rear zonkers were fixed while the front zonkers were attached to a mechanism which allowed the front wheels to be steered as the zonkers followed the tubular rail on the track. The rail track itself was not the typical high-banked, oval track design found in the United States. 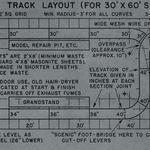 Rather, many of the British rail tracks used a road course layout design. The design of the zonkers and their location in the center of the chassis, combined with steerable front wheels, allowed the cars to turn both right and left as they raced around the track. The design of the tubular rail and zonkers system is attributed to Henri Baigent, an accomplished British modeler, in 1949. Baigent later went on to form a new company, Model Road Racing Cars, Ltd. (MRRC). British diesel powered rail cars eventually evolved into electric powered cars, but it was Baigent's original design that is generally credited with being the forerunner of modern slot car racing and MRRC today is a major supplier of electric powered slot cars and supplies.